Captain Picard begins mysteriously moving back and forth through time, seeing the Enterprise just prior to its mission to Farpoint and then 25 years in the future, where the aged crew have moved on from the Enterprise and drifted apart. Picard is at a loss to explain what is going on until he appears once again in the courtroom of Q, who has an ominous message for Picard and humanity. Why is Picard travelling through time? What is Q's role in all of this? How many crunches did Marina Sirtis do before putting on the cheerleader uniform again? Kevin: We have reached a bittersweet moment for TNG. It's the series finale, which is sad, but it's certainly once of the best episodes they have ever done, and that's very happy. There's so much going on here that it's almost hard to know where to start in analyzing it. I'm going to start with analyzing the episode in and off itself before diving into its larger significance. The science fiction itself here is pretty good. The temporal paradox, and the concept of anti-time are fun, and feel rhetorically consistent, even if they are completely made up. The episode is exqusitely paced, and for all its careening, never felt out of control. The scenes in both the future and the past, critically, had their own stories and impact, rather than merely serving the story in the present. Moments like Troi confessing her history with Riker in the past or Geordi and Data's concern about Picard's sanity in the future all breathed life into the other two timelines, and that kept the trips there interesting. Matthew: What keeps this from feeling like a series finale, oh, say "These Are the Voyages..." is that it is written with not only an eye for continuity, but also an eye for tone. In each time period, the characterizations were matched to episodes and character writing from that period in the show. It wouldn't do for Data to be too "human" in the past, and he isn't. He babbles, asks goofy questions, and misses much of the idiomatic humor of his colleagues. Tasha Yar is brash and insecure. Chief O'Brien is wearing his red lieutenant's uniform, since this occurred before the sexual harassment charge that derailed his career as an officer. The character balance of the show respects the continuity established by "Farpoint," too. Gone are Geordi, Crusher and Riker, since they are on the planet as of this point. The same goes for the present timeline, which follows up on Troi/Worf, finally (finally!) develops Picard/Crusher, and even throws Nurse Ogawa some story bones with a pregnancy storyline. The future story makes continual reference back to past elements of TNG stories, such as Geordi's relationship with Leah Brahms, Data's holding of the Lucasian Chair at Oxford, like his heroes (and TNG holodeck guest stars) Isaac Newton and Stephen Hawking, and so on. The overall impression given by the writing is one of loving care and effort. This is immensely gratifying for any fan who has followed the series fervently for seven years - the finale is being written by legitimate fans who love it as much as we do. Kevin: From an emotional standpoint, the episode is a goldmine of lovely and wrenching moments. I know Matt dislikes the Troi/Worf thing, but given the slow build they gave it and the fact that they directly engaged the Riker element in both the present and future, particularly the sense of there always being more time to get together, it saved it from simply being a shocking twist they added since they didn't have to deal with the fallout. The scenes of post-divorce Picard and Crusher were awesome. It felt like a real relationship, even though we only saw a snippet of it. What I loved most of all is how the emotional and character elements played into the episode's major arc and even that of the series. The crew did best when it worked together and trusted each other, and they suffered when they didn't. The crew not trusting each other yet in the past and not trusting each other anymore in the future provided real obstacles to saving the day, and it makes the relationships they have in the present more precious to both the characters and the viewers. Without getting schmaltzy, the episode manages to make those emotional bonds and our sadness at their ending a vital part of the story. Matthew: Yes, the overall character theme of trust and mutual love was well developed. It also didn't feel like it was too obvious or pedantic. If we're going to compare this to Generations (as seems obvious since it was created by the same writing team), AGT did not suffer from the sort of obvious "theme wrangling" of character dialogue. There is no hoary line here corresponding to "there are some who say time is the fire in which we burn." Instead, the theme is developed by showing us the different relationships between characters, not telling us about it. Kevin: Lastly, the show ties up not only the story and villain in introduced in the premiere, but the central theme of the show at the same time. Reintroducing the Q trial was a stroke of genius, since the entire show is basically about humanity's growth and change. It provided an entirely organic reason for I would argue the flat out best guest star in the series. A story and a series were set up in Encounter at Farpoint and both get a payoff in this episode. I would pit this finale against Seinfeld or M*A*S*H's any day in terms of the quality and consistency of its finale. Especially for a series that avoided arc storytelling, its ending manages to payoff the arc of the series both narratively and emotionally. The final scene alone strikes the perfect chord. It is a lovely, non-syrupy emotional moment that conveys a sense of the future for the show without crassly saying "Come see our movie!" Matthew: Yep. There is just about nothing that could please a true believer more than crafting a finale that is a direct relative to the premiere, idea-wise. Encounter at Farpoint was a vital, explicit explication of Gene Roddenberry's central set of ideas and questions about humanity - have we really improved, or are we the same ignorant savages we've always been, just with better gear? The Q character was his means of asking those questions in a dramatic way - had a regular character done it, it would have come off preachy and dumb. So by tying this finale to the very same questions, it validates the central premise of the entire series, and answers it. If I'm going to criticize just a bit here, I will say I wish that more characters than just Picard had demonstrated the sort of quantum leap of understanding that Q is looking for. But this is a minor quibble. Kevin: Well...what to say here? Everyone turned in a sublime performance. The episode focus on Picard, and boy does he deliver. The body language in that first scene with Troi was a master class in telegraphing thought via hand gesture. He was physically trying to retain the memory of what was happening. He loving nostalgic looks at the earlier versions of the crew were sweet. He carried himself like an older man in the future scenes and really portrayed the undertones that he might really be losing it. The rest of the cast was awesome too. Crusher's concerned look when she breaks the news to Picard, Spiner's ability to perfectly replicate early Data...all of it. It was a bravura performance all around. Matthew: Yeah, it was really his age acting in the future scenes that were the most impressive. Shatner was good at it in "The Deadly Years," but Stewart is spectacular at it. Of course, this may simply have to do with actually being older than Shatner was at the time. Whatever the case may be, his portrayal of someone who was searching for the words in a muddle and a haze was really powerful. Spiner has one of the toughest jobs, since he has aged most obviously among those asked to reprise their past roles. But his mannerisms, which are PERFECT in every detail, make you forget his paunch or his wrinkles. I wonder if he watched video. If he didn't, he would have to be one of the greatest acting savants of the past few decades. Kevin: And...John DeLancie. Thank you, sir. You were awesome in Encounter at Farpoint, and if anything, you were better here. He manages to telegraph the humor and menace that made Q who he is with such agility. His mocking in the scene in primordial France was a scene maybe half a dozen people on Earth could pull off without making it silly. His scene with Picard at the end may be my favorite. The way he just leaned in and then back was flawless. Matthew: John De Lancie seems to have the singular ability to be the best performer in whatever he is in. He chews scenery without leaving any teeth marks. He is over the top without appearing ridiculous. And he layers subtle little details, like the little physical moves you mention, like a master. He would have absolutely dominated my Top 5 guest stars list, if I had not disqualified him for being a semi-regular. He totally made Farpoint what it was, and he does nothing but enrich this finale, as well. Matthew: I agree on McFadden in the present storyline. But what really does it for me is the future storyline acting. She effectively portrayed both age and experience, as well as a lot of water under the bridge between her character and Picard's. Kevin: I loved the future model of the Enterprise. I have one of the Playmates version of it that transforms from the regular into the future Enterprise-D and it was hands down my favorite toy as a kid. I loved the Klingon ships and I love that they were brought back in DS9. The Pasteur model was amazing in every way. It managed to harken back to a design not seen since TOS but still be new and interesting. Matthew: We've said it before more than a few times, but never has it been more true - I can't wait to see this on Blu-Ray. You've mentioned the highlights as far as model work go, but I want to focus on the Pasteur a bit - they do in this episode what they failed to do in many prior shows - make a ship other than the Enterprise feel like a real place, with a viable bridge, ready room, turbolift, etc. It's a great set all around. But many of the terrestrial sets were spectacular, too, including Data's drawing room, the vineyards (despite some clearly non-French mountains), and the post-atomic horror courtroom. This episode positively oozes money. Kevin: I think the aging make up with the best the series has done. Picard, Crusher, and Geordi really managed to look actually older. They may have gone a bit overboard on Riker, but at least he was not creepy puffy. In terms of de-aging, they did a good job, too. Picard looks like he did in the first season, even down to the way the uniform shapes him. Colm Meany looked like he did when he was simply called "Conn." Troi and Yar looked good. Troi in particular didn't look like she was trying too hard to look ten years younger. Their hair was a little off, but was can assume the products used to make it that way in 1987 have since been banned by the United Nations. Matthew: They replicated O'Brien's Irish Jheri Curl to a tee. The Troi hair is forgivable, because she was changing it every episode anyway. But Yar's hair I have to criticize. It never changed, and it clearly had the two-tone look which was missing here. I really liked the re-use of the McKinley station CGI footage, being shown from within the shuttle. It harked back to TMP and ST2 in a way that was really pleasing for fans. Would a new shot have been better? Sure. But I'm not going to complain too hard amidst this embarrassment of riches. Kevin: As sad as I am that I the series ended, I could not be more satisfied with the finale. It pays off the character and story arcs of the series. It's some of the best acting and effects work of the show. Moore and Braga have talked about splitting their time between this and Generations, and I'll say in advance of the film, I think this got the lion's share of their attention, and I am okay with that. I'd rather have a self-contained, successful series and an at least decent movie with issues as opposed to a great movie and a let down of a series finale. This is the most enthusiastic 5 I have ever given. Matthew: I don't know if it's the single best show in the series. But it's a key player in the conversation. With the exception of one internal continuity error (the three "identical" invesre tachyon beams, mentioned in the podcast at length) which in no way diminishes the impact of the story, it is a perfect ending to a great ride. In fact, this episode ties up the series in such a way that it helps cement the feeling of TNG being a unity, instead of just a bunch of stuff that happens. It is superbly acted and has wonderful production values, to boot. Anyone not calling this a 5 out of 5 doesn't deserve their rubber ears or command uniform. I heartily agree with the 5 for a total of 10. I just read your review. I have not seen the episope in a long time and look forward to watching it some time this week. Its funny I like how you mention the Seinfeld finale. When I saw that episode the first time I hated it. It was not until I was older that I realized how brilliant that finale was at showing how truly awful those four people were. I can only imagine that AGT ages just as well. If they were there to see the formation of the anomaly, they should have seen it shrinking into non-existence, not forming into a cohesive thing. It should have been there when Starfleet did its long-range scans, and it should have been there when the Pasteur went looking up until the point where the Pasteur activated the tachyon pulse. (Spell check wants that to be tachycardia. Silly spell check.) Then it should have shrunk into nothing at the point of formation. I am intrigued by your hour-glass-shaped-explanation; can you go into it further? I think the basic idea is the the anomaly has a cone of effect widening into the past, but also a symmetrical cone of effect winding forward. So the moment of its formation is the singularity of sorts, with an "hourglass" shape of effect in spacetime. 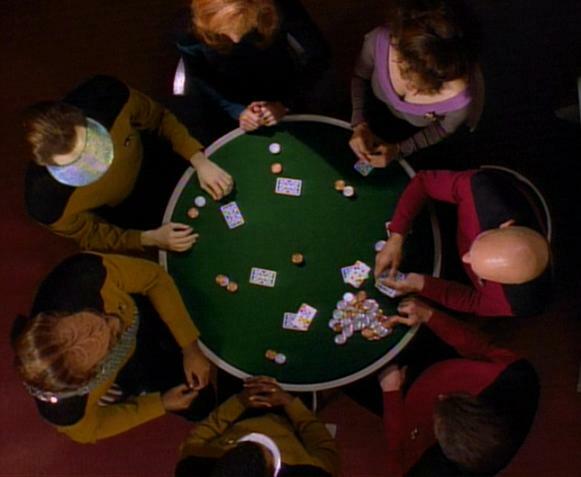 Thus, the scenes in which the anomaly is affecting the 3-nacelle Enterprise are depicting the other end of the hourglass. It's speculative, but it helps explain an otherwise inexplicable continuity error. So, it's non-existent at the point of creation, but it comes into being a day before AND a day after, and then gets bigger going back and forward from those points? You know, I think I can buy that. I'm positive it's not what they were headed for, but it's good enough to make it nag less. But could they have gone out with a bigger bang or on a higher note if they'd tried? I don't think they could have. But yeah, I defy even an assimilated Vulcan to watch the last scene and not tear up at "Sky's the limit..."
Final scene: *welling up* "I should have done this a long time ago." Best TV show ever made. I know I've taken this trip later on than I should have, but thank you for this fantastic blog and expert insight. Bring on DS9; hopefully I'll catch up to your current run through by season 3. Is this really your first time through TNG? If so we're honored to be your guides. What would some of the other shows in your "greatest" conversation?